full-height vertical circulation atrium greets visitors. The yellow wall acts as threshold to the interior program spaces and telegraphs through the muted facade. Photo by Michael Vahrenwald. On the first floor, the cafe looks into the interview rooms, which in turn look into the children’s play area. This transparency is key to supporting the organization’s mission of connecting at-risk children with adult mentors. Photo by Michael Vahrenwald. The transparency established on the first floor is continued on the second-level office floor, where perimeter offices look onto a central area for itinerant workers. Photo by Michael Vahrenwald. 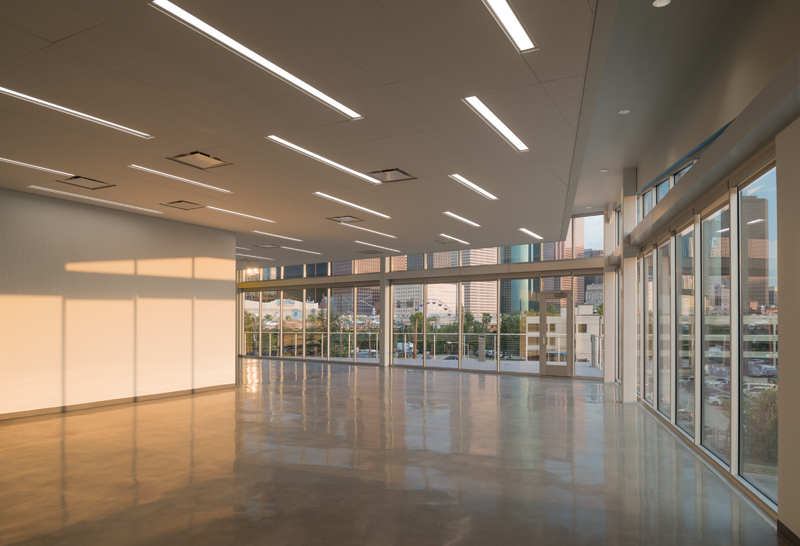 The third floor features a flexible open space that can be used as a children’s craft area or as a venue for after-hours cocktail receptions. The terrace offers sweeping views of downtown. Photo by Michael Vahrenwald. 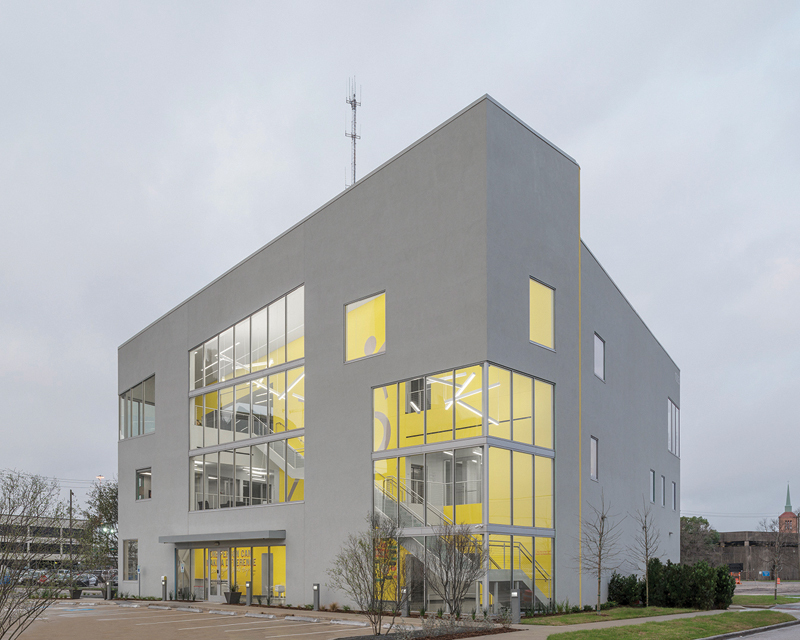 Before moving to its current location on Washington Avenue and Franklin Street just northwest of downtown Houston, Big Brothers Big Sisters (BBBS) Lone Star occupied a nondescript, dilapidated building on Hillcroft. It was one story tall and comprised a warren of rooms without many windows, like an abbey, or a prison. The dearth of daylight was compensated for by fluorescent fixtures whose white diffusers had some time ago matured to a tobacco-stain yellow. The 155 members of the organization’s staff relied on the dedication they felt to their higher purpose — connecting at-risk children, “littles,” with adult mentors, “bigs” — in order to make it out of bed each morning and into the office. The new site is certainly more visible, and its central location is more conducive to the nonprofit organization’s mission. Its proximity to downtown, Buffalo Bayou Park, and the Washington Avenue corridor places it near BBBS’ core demographic of volunteers. The littles, mostly children of lower-income families, also live nearby. The building that now occupies this highly trafficked locale is also more visible. It quite literally says, “Hey! I’m here!” It’s not only an announcement of BBBS’ presence, but also, in its openness of spirit and transparency, it is an embodiment of the organization’s mission. Designed by New York-based architecture and design studio Agency—Agency with local firm Method Architecture, the architecture is at once banal and slightly strange, with subtle moves that catch the eye, even when one is passing by at a fair clip in a car. “The scale of the building responds to the need to be visible in that part of the city,” says Tei Carpenter, director of Agency—Agency. “It’s meant to be seen at the speed of traffic.” For example, the building is pentagonal in plan, with one face canted out to register the wedgelike shape of the site. The EIFS (exterior insulation finish system) facade is muted, an indeterminate beige-grey color, but vibrant colors — yellow, coral, teal — painted on the interior walls and the sills telegraph through the large windows. Inside, the program is spread across three floors, which are connected vertically by an atrium and staircase on the east, facing downtown. 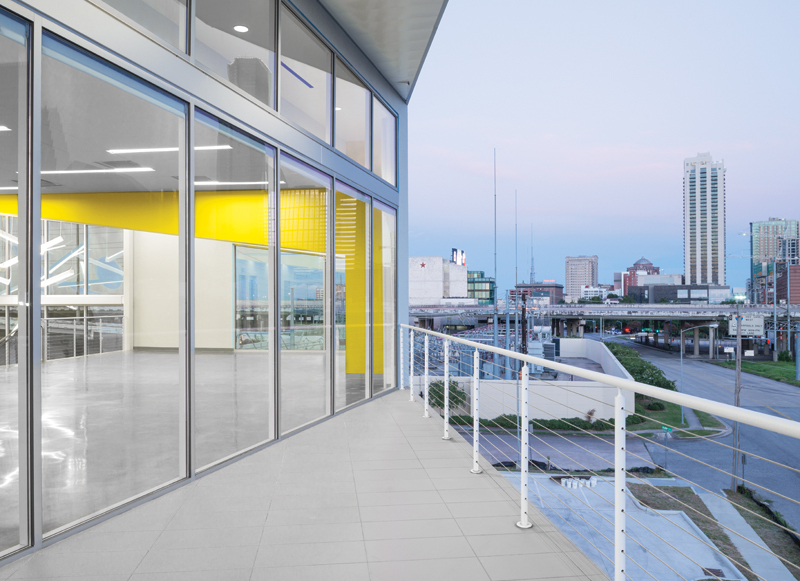 A bright yellow painted wall acts as a threshold between this public circulation space and the interior program elements: community spaces on the first floor; offices on the second; and a flexible event and activity space, complete with an outdoor terrace overlooking downtown, on the third. Throughout, views were an important feature of the architectural design. On the ground floor, the rooms where bigs and littles are interviewed to find a match feature windows that open to the cafe and children’s play area, so that BBBS staff, the family of littles, volunteers, and the littles themselves can see who’s around and what’s going on. “The design is connected to the mission: Trust us with your child,” Carpenter says. “It showed a belief from the client that space can amplify feelings and aspirations.” But since the conversations that take place in the interview rooms can often be personal in nature and induce tears, blinds are in place for privacy. Other windows in the play area look out on a landscaped courtyard. On the office floor, views are also important. After suffering through their previous home, the staff wanted windows, and to be able to see their coworkers. Private offices ring the perimeter, and there is a large open workspace in the center for itinerant workers — those who manage the far-flung areas that BBBS Lone Star oversees. While most of the surfaces are muted in tone, the sills here, as well as throughout the building, are painted in tones of purple, blue, and teal, in keeping with BBBS’s brand color at the time of construction. Some of the Steelcase furniture is also purple. This floor can be locked off to keep it secure when there are events on the third floor during the weekend. The third floor can go high or low. 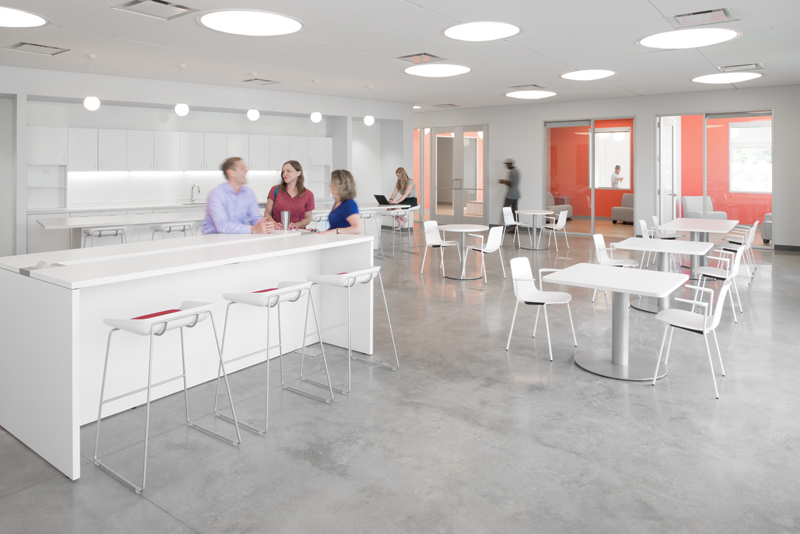 It can be set up for a cocktail reception for donors, for which purpose there is a catering kitchen, or be used as a crafting area for the children, for which there are polished concrete floors that are easy to clean. Textured wallpaper differentiates this area from the other two floors.